Tutubi has always been a football fan from way, way back when the Azkals were losing, when nobody cares about them, when no women scream at their sight and when no people will recognize them until the momentous AFC Suzuki Cup 2010 when they upset powerhouse Vietnam and proceeded to the semifinals for the first time in history. Tutubi flew on the first flight to Singapore of Philippine Airlines. On this fateful morning, he experienced rude treatment by the Immigration Officer who wrongly thought he's an OFW looking to avoid the OFW exit clearance. It was before embarcation in Singapore Changi Airport when he noticed a commotion of passengers a few rows before him and noticed Azkals star striker Phil Younghusband posing for fans pictures. Tutubi caught up with the Azkals on the walkalators, at the immigration counters and carousel of Changi Airport and was able to take pictures. He noticed though that due to the showbiz insanity of Pinoys, they can only recognize brothers Phil and James Younghusband and completely ignored the others. 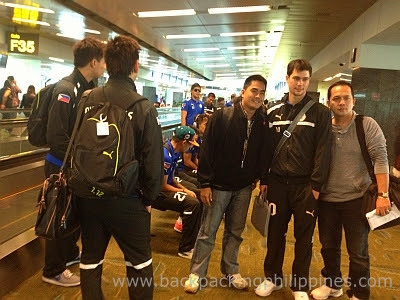 Tutubi also caught up with home-grown Azkal Ememio "Chieffy" Caligdong and goalkeeper Ed Sacapano (nicknamed EdSa) but just near the bag conveyor belt.